When entering the lobby of the show, you are greeted by displays of various cars with true high-end audio systems. 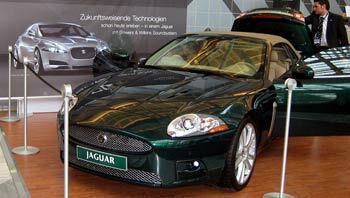 Seen here is the Jaguar XR (�100,000) with well-appointed leather interior and Bowers & Wilkins (B&W) sound system. 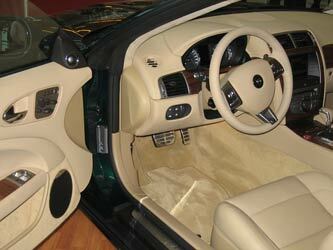 The doors have 6.5-inch driver in the door and a 1-inch metal dome tweeter in the door's upper corner. 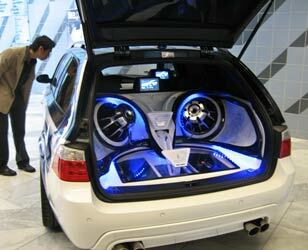 Woofers are in the rear and amplification is of high quality. 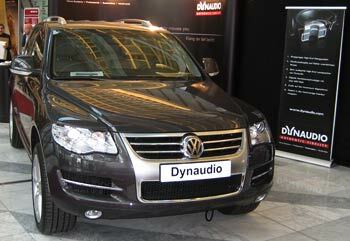 German automobile manufacturer VW chose a system by Dynaudio with 600 watts of power for their Toreg SUV. They seem to have kept the vehicle locked so not sure what the driver compliment consists of. 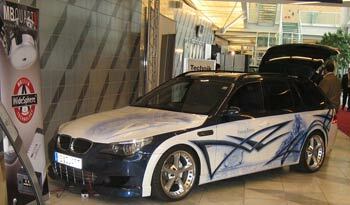 Munich is home to BMW, in fact the factory is located a mere few hundred meters from the M.O.C., and here is a boldly painted M5 equipped with an MB Quart full-on multi-media system. High End Society's Munich show does not have a brief music event each night and, right, favors live music events throughout the show in many rooms and within the hallways. My previous reports mention this, yet perhaps i need to stress the quantity of live music. 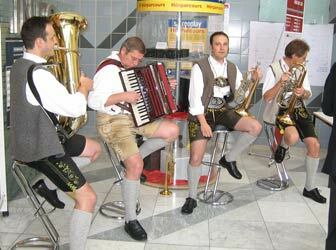 Everything from small ensembles playing classic jazz to German bands playing traditional music, the variety is a joyous relief from mainstream audiophillia. 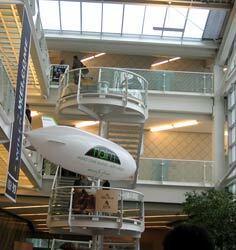 While not the Goodyear blimp, Naim Audio had a radio-controlled blimp flying high in the entranceway before the show. This is a great way to take advantage of the very spacious, over 30 feet high ceiling. And with that said, on with the audiophile gear! 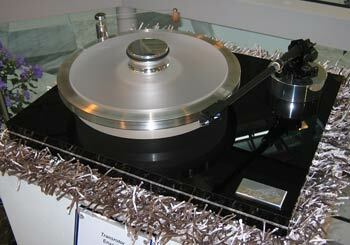 Turntable manufacturer Transrotor had three new world first previews of turntables that were being launch at the show. Specifically, their Classic Nero, Enya 9, and Enya 12 (�1566, �2600 and �3000 respectively). Pictured above is the Enya 12 with an SME 12-inch tonearm. While the platter is made from acrylic, the base is a sandwich of acrylic/aluminum/acrylic to dampen resonances and motor is of the two-phase synchronous variety. Neodymium magnets float the platter separately from the belt drive to reduce both motor and ambient noise. Build quality is precise and exact, as one would expect from a Germany company. Due to the importance of this show, the mass manufacturers like Denon, Panasonic, etc. have sizeable rooms. 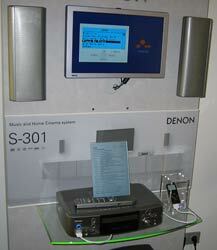 Seen here is Denon's new S-301 (�1849) DVD entertainment system capable of handling audio/video, iPod, SACD, RDS, HDCD, HDMI, etc. While a blue LCD front panel aids in use, it provides a vastly more informative video output for on-screen operation. First time seen anywhere is Nain's new Supernait (�4000) stereo receiver that has six inputs, AM/FM tuner, 80 watts per channel, five digital inputs, internal 24-bit/192kHz DAC and headphone jack. Subwoofer output is also included. Lovers of Naim will welcome the pair of jacks, one for preamplifer and the other for amplifier, for those who desire upgrading the stock power supply for a stronger outboard unit.